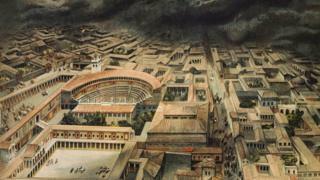 Pompeii was famously destroyed on 24 August in 79 AD – or was it? Archaeologists in Italy have uncovered an inscription they say may show that the history books have been wrong for centuries. Historians have long believed that Mount Vesuvius erupted on 24 August 79 AD, destroying the nearby Roman city of Pompeii. But now, an inscription has been uncovered dated to mid-October – almost two months later. “The new excavations demonstrate the exceptional skill of our country,” Alberto Bonisoli said. Historians have been able to date the eruption of Vesuvius with apparent certainty thanks to ancient writings that purported to share first-hand accounts. They came from Pliny the Younger, an elite lawyer and author of ancient Rome, who wrote about the death of his even more famous uncle, Pliny the Elder. “On the 24th of August, about one in the afternoon, my mother desired him to observe a cloud…” he wrote in a letter to Tacitus, a Roman senator and historian, about the events of that day. According to his account, Pliny the Elder was then a fleet commander at Misenum – modern day Miseno – across the bay from Pompeii. He took a ship to stage a rescue for those in danger from the volcano. But he did not return from the venture. Pliny the Younger, meanwhile, watched the destruction unfold from the other side of the bay. “I have faithfully related to you what I was either an eye-witness of myself or received immediately after the accident happened, and before there was time to vary the truth,” he wrote. But the latest discovery calls such certainty into question. The inscription discovered in the new excavations is nothing more than a scrawl in charcoal, likely made by a worker renovating a home. But it is dated to 16 days before the “calends” of November in the old Roman calendar style – which is 17 October in our modern dating method. “Since it was done in fragile and evanescent charcoal, which could not have been able to last long, it is highly probable that it can be dated to the October of AD 79,” the archaeology team said in a statement. They believe the most likely date for the eruption was, in fact, 24 October. There has long been some speculation that the eruption happened later than August, particularly centred around evidence of autumnal fruits and heating braziers discovered in the ruins. The charcoal inscription supports that theory, the Pompeii archaeology team said. So did Pliny the Younger record things incorrectly? His letter to Tacitus was written some 20 years after the eruption in 79 AD. And the original copies have not survived the intervening 1,939 years. Instead, our modern reading of the text is based on translations and transcriptions made over the centuries. In fact, various copies of the letters have contained dates ranging anywhere from August to November – though 24 August has long been accepted. The differences between the texts could easily have been influenced by confusion over the ancient and modern systems of counting days. The discovery was made in the new Regio V excavation, uncovering previously untouched areas of the ancient city. In addition to the simple inscription, grand houses have been unveiled this week with elaborate frescoes and mosaics.